Born into eternal life on March 29, 2019 at the age of 92. Loving wife of the late Edward. Beloved mother of Dennis (Mary Jo) and Chris (Charyl) Kowalinski. Grandmother of Chad (Brittany), Craig (Jenele), Christopher (Sasha), Mary Therese, John, Timothy, Matthew and Julia Kowalinski. Great Grandmother of 6. Ruth is further survived by nieces, nephews, other relatives and friends. 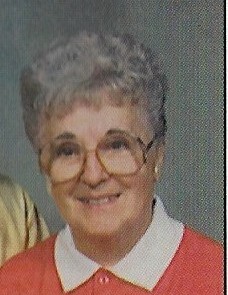 Ruth worked as a Head Cashier at Sentry and Kohl's Grocery Stores, she was very active at St. Helen Church - she served as a past president of Christian Mothers, a cord rosary maker, fish fry kitchen staff. She loved to bake and give away her treats. A Mass of Christian Burial will be celebrated on Friday, April 5, 2019 at ST. JOHN PAUL II - ST. HELEN SITE 3329 S. 10th Street at 10:00 A.M. Visitation at Church from 9:00 to 9:45 A.M. Entombment St. Adalbert Cemetery.